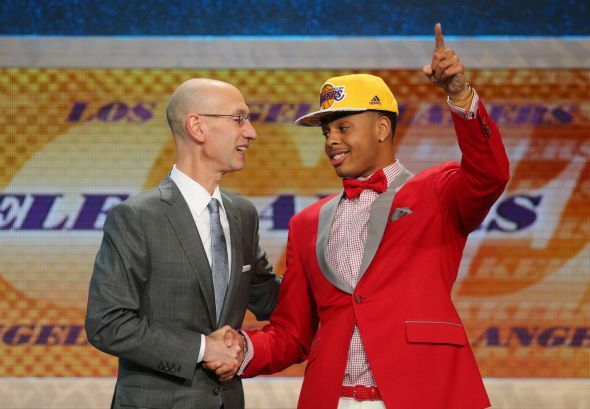 D'Angelo Russell #1 of the Los Angeles Lakers will make his regular season debut against Karl-Anthony Towns and the Minnesota Timberwolves as the NBA released its 2015-16 schedule on August 12, 2015. In this file photo, Russell poses for a portrait during the 2015 NBA rookie photo shoot on August 8, 2015 at the Madison Square Garden Training Facility in Tarrytown, New York. The 2015-16 NBA schedule became public on Wednesday, which of course means the Los Angeles Lakers' schedule is out, too. In the Lakers' regular season opener, no. 1 pick Karl-Anthony Towns comes to LA in what should be no. 2 pick D'Angelo Russell's NBA regular season debut. From there, the Lakers play every other day until they hit the East Coast for an early five-game road trip that includes New York, Brooklyn, Miami and Orlando. That early November road trip, however, is only an appetizer for a lengthy December roadie that features eight road games in 12 nights. Also, the first game on that roadie is in Philadelphia (Dec. 1) and could well be Kobe Bryant's last appearance in the city where he attended high school. As a fan of the Los Angeles Lakers, it seems like a sight to behold of the team’s new direction. Free agency and the trade market are no longer providing the pool of additions that they need for a quick turnaround. With the plethora of losses that’s come over the last two seasons, the Lakers have been acquiring solid pieces via the NBA Draft. Not only has the team found them in the lottery (Julius Randle, D’Angelo Russell), but late round picks (Ryan Kelly, Jordan Clarkson) have given the team glimpses of hope as long-term producers. The other thing that the draft process provides for teams are thorough looks of players who slip through the undrafted cracks. Recently, the team was able to make a solid pickup of one of the 2015 NBA Draft candidates in Jonathan Holmes. The University of Texas senior worked out for the Lakers prior to the draft, and has since found himself with a chance to compete for one of their 15 roster spots. The Hornets will play 16 sets of games in back-to-back nights. That represents more than a third of the 82-game schedule, but it’s fewer than some recent seasons. Last season, the Hornets played an NBA-high 22 sets of back-to-backs. Also, two other factors reduce some of the wear-and-tear that back-to-backs represent: Two of those sets of back-to-backs are home games, eliminating the fatigue associated with travel. And the Hornets have no instances of four games in five nights this season, which used to happen regularly. Without extending the season by a week at the start or a week at the end, Silver made a dent in those numbers in an effort to reduce fatigue, wear and tear, including injuries, and increase the level of competition. •Back-to-backs have been reduced to 17.8 per team for 2015-16, down from 19.3 last season, and no team has more than 20 back-to-backs this season. •Long-distance back-to-backs have been trimmed from 111 last season to 85 this season; back-to-backs that cross a time zone have also been cut from 194 last season to 160 this season. •Four games in five days have been reduced to .9 per team for 2015-16, down from 2.3 per team last season. •The NBA reduced the number of miles traveled per team by 2%. The Lakers will start the 2015-16 season at home on Oct. 28, playing host to the Minnesota Timberwolves, and the opener at Staples Center is expected to showcase the top two picks in this summer's NBA draft.. The Timberwolves had the No. 1 pick and selected 6-foot-11 center Karl-Anthony Towns, while the Lakers surprised many by taking 6-foot-5 Ohio State point guard D'Angelo Russell at No. 2. The NBA on Wednesday released its full schedule for next season, which includes the Lakers playing host to the Clippers on Christmas Day at 7:30 p.m.
Kobe Bryant, who played only 35 games due to injuries last season and turns 37 later this month, is recovering from shoulder surgery but will return for a 20th season with the Lakers. Outside of Bryant, the Lakers are generally a young team, and they'll be tested early in the season with 22 of their first 33 games on the road. December will be especially challenging, as the Lakers face an eight-game trip over 12 days that concludes with games at San Antonio on Dec. 11 and at Houston on Dec. 12. $$$$$ = Scheduling woes. There is no concern for the players or the patrons. The quality of play plummets and injuries mount with so many games in such a short period of time. The schedule evens out in January as the Lakers play 12 of 17 games at home, and in March, with 12 of 15 at Staples Center. EL SEGUNDO, Calif. (AP) — Undrafted rookie forward Jonathan Holmes has agreed to a multiyear deal with the Los Angeles Lakers. The Lakers announced the deal Thursday. Holmes spent the past four seasons at Texas, averaging 10.3 points and 6.1 rebounds per game as a senior. He plays a versatile two-way game, with a solid 3-point shot and strong defensive instincts. After going undrafted, Holmes averaged 12.2 points and 5.6 rebounds for the Boston Celtics' entry in the NBA Summer League in Las Vegas last month. Holmes will compete for a roster spot in training camp with the rebuilding Lakers, who are coming off the worst season in franchise history. Los Angeles drafted D'Angelo Russell, Larry Nance Jr. and Anthony Brown in June, while 2014 first-round pick Julius Randle is returning from injury. The Lakers signed undrafted University of Texas forward Jonathan Holmes to a multi-year contract, General Manager Mitch Kupchak announced Thursday. Terms of the 6-foot-9, 22-year-old’s deal were not released. Holmes, a four-year starter at Texas, was rewarded for a solid performance in the NBA Summer League, where he averaged 12.2 points and 5.6 rebounds as a member of the Boston Celtics’ entry. Holmes, who has good range for a physical player with a 240-pound body, shot 56 percent from the field and 46 percent from beyond the arc in eight summer-league games. Cha*n note: There are also rumors morris could go to 5 or 6 other teams but he will not be with the Suns next season for certain. I've been told this publisher is not a serious one so take this with a big block of salt. Even though the Los Angeles Lakers have made a number of moves this off-season, the front office is still hard at work as they prepare for the start of training camp. The Lakers have already reportedly agreed to a deal with forward Jonathan Holmes and they reportedly held a workout earlier in the week that included guard Bobby Brown. New D-Fenders Coach Casey Owens. Last week, the D-Fenders named Casey Owens head coach of the Lakers' NBA Development League affiliate..
Owens was an assistant with the D-Fenders for the 2013-14 season. Under then-coach Bob MacKinnon, the team finished 31-19. Like the Lakers last season, the D-Fenders struggled to win games, finishing 17-33 under Phil Hubbard, who was not retained. "When the D-Fenders decided to make a coaching change, we kind of rekindled our romance and lo and behold, here I am, moving back to L.A.," Owens said to The Times. "I couldn't be happier."